Cardiac Care & Safety, Inc. 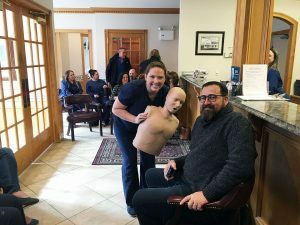 Visits The Dentists of Newtown - Cardiac Care & Safety, Inc. Cardiac Care & Safety, Inc. 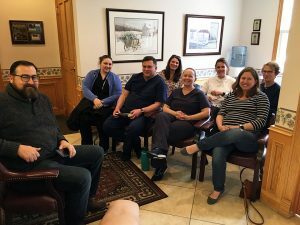 Visits The Dentists of Newtown - Cardiac Care & Safety, Inc. Normally, we don’t consider how important emergency preparedness is until we are in a scary situation. Emergencies happen fast and can impact your establishment negatively if not handled appropriately! If you work in the healthcare industry, you are expected to maintain up-to-date CPR and Basic Life Support (BLS) certifications. In Pennsylvania, continued safety education for dental professionals is required by law every 2 years. Recently, we were called upon to provide our safety services to The Dentists of Newtown. President of Cardiac Care & Safety, Inc., Jim Spaulding, stopped by to provide CPR training to their team of dentists. Looking for a highly qualified safety training company in Newtown, PA? We have our training program down to a science! If your team requires safety training, one of our instructors will come to your location with all the necessary tools to make the process informative and engaging. Get a quote for our dental CPR training or contact us for more information about our emergency training for your group of healthcare professionals.